Set back rolled arms and a box seat cushions give this chair a transitional look for your decor. 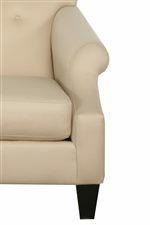 The tight back is embellished with a row of button tufting to complete the design. Built for quality you can appreciate, this chair will be a beautiful new focal point to your decor. The 153 Transitional Chair with Rolled Arms and Button Tufting by Bauhaus at AHFA in the area. Product availability may vary. Contact us for the most current availability on this product. Elegant in style, this upholstery collection offers luxury and comfort to your living room. Relish the sophisticated details of the set back rolled arms, box seat cushions, welt trim, and button tufting. The 153 collection is a great option if you are looking for Transitional furniture in the area. Browse other items in the 153 collection from AHFA in the area.